when the tide is right. Well behaved dogs are very welcome. Beaver Cottage has glorious views over the river Alde with complete access down to the river front. We have a couple of kayaks you can borrow (at your own risk) to explore the river and marshes. Beaver Cottage is in a prime area on the heritage coast. From the garden you can walk along the river wall into Aldeburgh, past the beautiful mud flats where birds rootle in the mud. Or you can walk through the North Warren bird reserve to Thorpeness and back along the beach, Or along the old Sailor's Path by the river to Snape. The shared 11 acre garden is full of wildlife including woodpeckers, a Barn owl called Strix,river and garden birds, too many muntjack deer, many rabbits and foxes and if you are lucky you might see a seal in the river or possibly an otter. 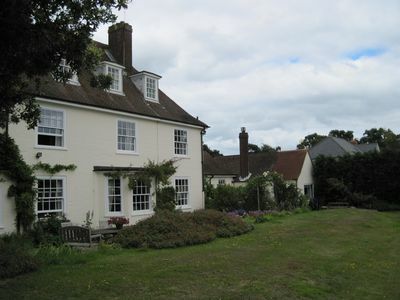 Beaver Cottage is 5 miles from Snape, home of the Snape Maltings. The Maltings have music throughout the year including the Proms in August and the Festival in June featuring many famous names. Aldeburgh is a traditional East coast seaside town. It has a Summer Theatre which has productions nightly over the summer months, a long beautiful beach, two of the best fish and chip shops in Britain and its festival that runs in June. can watch the many races on weekends throughout the Summer. 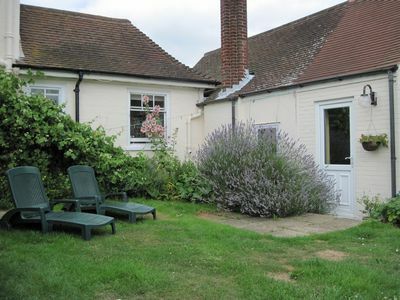 Just 15 minutes drive from the RSPB bird reserve, Minsmere, and in the heart of the Suffolk Heritage Coast, Beaver Cottage is a wonderful place to experience it all whatever the weather.